Oliver Wright measuring a mature tree, next one down is : A typical willow tree planation. Bottom one is : A weeping willow. J S Wright & Sons Limited, purchase Cricket Bat Willow from all across the country. If you have a parcel of 5 trees or more, we would be happy to come and give you a quotation, as to the value of your trees. Valuations can only be made following a site visit and not by telephone. It is a good idea to send us some photos in the first instance if you are unsure if they are the correct variety. What size should the trees be? The ideal trees should have at least 60 inches (152.5cm) of clean trunk, ideally 84 inches (213.5cm), from ground level to the first branches, having been trimmed of its side shoots throughout the trees life. Trees are ready once they reach at least 58 inches (147.5cm) around the trunk at 4′ 8 inches (142.3cm) from ground level. All trees purchased and felled are always replaced with a top quality willow set. 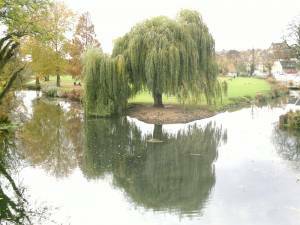 There are numerous types of Willow tree, most of which cannot be used in the production of cricket bats. We have, below, given a brief description of the the two main types of willow we come across on a regular bases, The Cricket Bat Willow which we can use and the Weeping Willow that cannot be used in any way. Salix Babylonica (Weeping Willow) are a very common ornamental willow, grown for its very distinctive and decorative look, in the way that its foliage hangs down. This type of willow is NOT suitable in the manufacture of cricket bats. The wood is too dense and heavy to make a bat with. The trees used in the manufacture of cricket bats is the Salix Alba Caerulea (Cricket Bat Willow). This type of willow is very fast growing with a single straight stem. It also has slightly larger leaves than normal white willow, being 10 to 11cm long and 1.5 to 2cm wide. The leaves are also a more blue-green in colour. 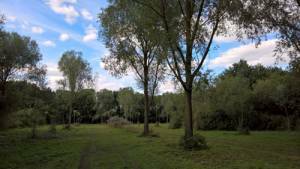 If you have any cricket bat willows that are ready for felling please contact Oliver Wright via the contacts page, making sure you include a contact telephone number and the area the trees are in, and if possible a picture of the trees.